Construction of Cal State LA’s first traditional-style student housing facility, located next to our existing student apartments, is officially underway. 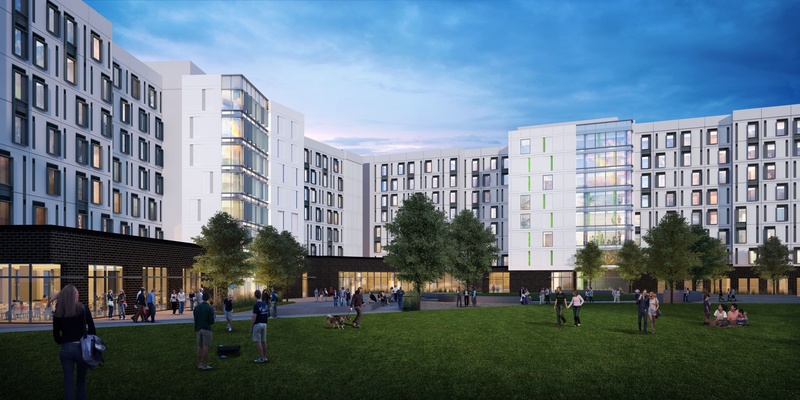 Student Housing East will offer 1,500 beds for freshmen and sophomores, a dining commons and a learning center. Construction began over winter break. The project is scheduled to open in fall 2021. Regular construction updates will be posted on this page. Visit to stay in the know, view photos of our progress or report any construction related issues. * Residents living in Phase I near construction activity, please keep your windows closed to prevent dust from entering your apartments and to minimize noise. * Due to construction and limited parking on campus, Parking Services will no longer require residents to move their vehicles out of Lot 7A for street sweeping on Friday mornings. Housing and Residence Life will remove trash debris each week and limit street sweeping to spring break and after finals. * ‘Cardiac Hill’, the stairway from lot 7 to Circle Drive, and the loop are closed. These closures will remain in effect throughout construction.